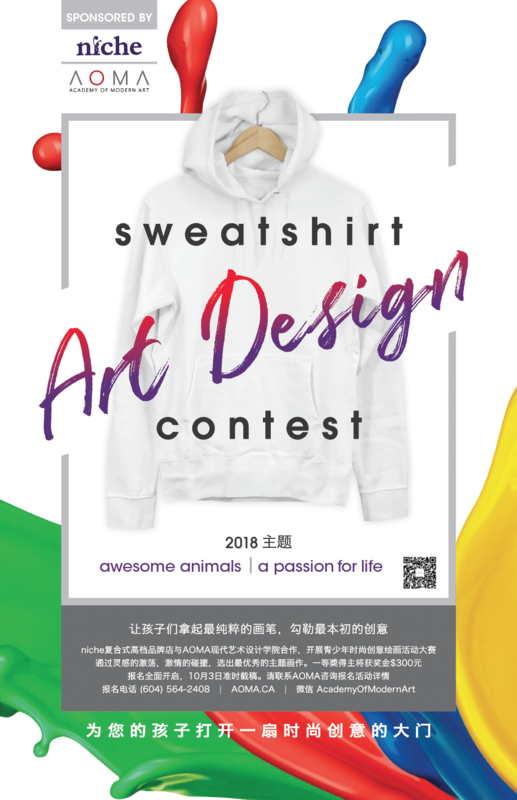 This fall, you can enter our contest to have your art featured on a sweatshirt for Niche Fashion’s winter line! We will accept entries in either traditional art pieces (paintings, drawings etc. ), or digital art. See our entry form for contest details. To enter a painting, drawing or another physical piece of art, follow these steps. Print out our entry form pdf and fill it out and attach it to your art piece. Bring both to the AOMA office. Submit your entry fee of $20 each, payable by e-transfer (to info@aoma.ca), cheque to “AOMA”, or cash delivered to the AOMA office. To enter a piece of digital art, follow these steps. Download our entry form pdf and fill it out. You can do this digitally or by printing it out, filling it out by hand, and scanning it back in. MEDIA ADVISORY: Growing Kerrisdale Art Studio Offers Personalized, Small Group Instruction.